Mentoring is a big topic in the professional world. For years, people have identified mentoring as an option for retention of diverse populations in environments where people are underrepresented. Having someone to talk to and to receive feedback from can prove to be invaluable to trailblazers at every professional level. This is demonstrated in a variety of mentoring tips and initiatives, especially those targeting people in science, technology, engineering, or mathematics (STEM). With emphases on mentoring across a variety of occupational sectors, I dug deeper into my own mentoring thoughts and experiences. What do I wish that I had known before I began my academic career? In what ways might I guide others interested in identifying an effective mentor or serving as a mentor? 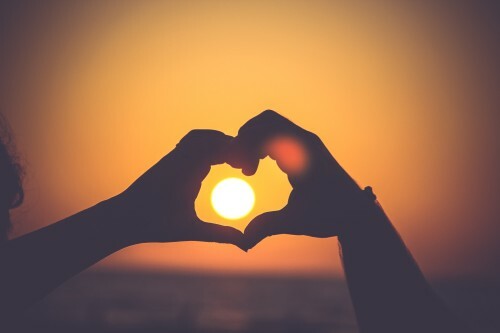 I propose that we look to the most loving and cohesive relationship of all as a point of guidance in professional mentoring- marriage. Read more about my “Something Old, Something New, Something Borrowed, and Something Blue” (ONBB) mentoring model below. Representing the traditional model of mentoring, the Old mentoring component connects a mentee to mentors who know the game and how to play it. It is vital for mentees to connect to these experts who possess organizational knowledge and credibility in their fields. These mentors are great at introducing mentees to cultural and professional norms and to ways of doing business so that feathers are not ruffled. In my case, Old mentors are seasoned faculty who have gone through the promotion and tenure process at my university. Since I am an engineering professor, many of my Old mentors are male engineers who are well-received in their professions and are leaders of professional and organizational disciplinary societies or large-scale research centers. How to Identify Your Old Mentors: Look for the “go-to” people and the people who possess organizational knowledge and respect. These are the people who lead initiatives in your field. Your goal is to connect to them so you can enter those doors as well. The New mentoring component engages mentees with “out of the box” people who are experts in areas that are outside of your field. People like this may not be well-known in your profession but are widely recognized experts in their own organizational circles. For me, this mentoring occurred when I engaged with my friend and colleague, David Brim. David is a social marketing guru who created my personal website (Prepared to Be a Pioneer website), my research website (International Institute for Engineering Education (i2e2a)), and the site for an educational assessment tool that I am commercializing. With his team of creatives, I have transformed my thinking so that I consider both marketing and my engineering education content in my professional endeavors. Borrowed mentors are somewhat similar to New mentors. They differ, however, in that there is some professional overlap between what they do and what you do. Their interdisciplinary perspectives allow you to expand your network to people who might work in multiple domains of expertise moreso than a single field. When you meet these mentors, it may take longer for them to recognize how your interest align, and they may not yet who you are or what you have to offer them. For me, this was demonstrated with my engagement with a colleague interested in professional and personal interactions among individuals. His interest from a business perspective, coupled with my expertise in professional development for academics, resulted in my co-leadership and cosultation on a social networking mobile application. How to Identify Borrowed Mentors: These mentors are often found through common connections- people who know you and know your potential mentor. Research your current networks to identify potential connections to people with common interests in multiple occupational sectors. Blue mentors are also what I call “Bad Day Buddies.” These mentors may have no knowledge of your professional work or expertise, but they know YOU. They know how to listen to you and to respond to you based on your unique personality and preferences. They don’t condemn you for being real or honest, and they are not jealous of your successes. My Blue mentors are people in my inner circle. I have a couple of female faculty of color in my life with whom I express my frustrations and most intimate professional views. I know that they will not betray my trust and will give me advice that I don’t always want to hear but need to hear. How to Identify Blue Mentors: There is no formula for finding these mentors. When you have a Blue mentor, you know it. This type of mentorship occurs organically and often among peers. Are you still wondering where to start in your identification of your Old, New, Borrowed, and Blue Mentors? Add your name to my contact list, and I’ll provide guidance as you look for them! How to Identify Old Mentors: Look for the “go-to” people and the people who possess organizational knowledge and respect. These are the people who lead initiatives in your field. Your goal is to connect to them so you can enter those doors as well. The New mentoring component engages mentees with “out of the box” people who move beyond traditional boundaries within a field. People like this may not be well-known in your profession but are experts in their own organizational circles. For me, this mentoring occurred when I engaged with my friend and colleague, David Brim. David is a social marketing guru who created my Prepared to Be a Pioneer website, my International Institute for Engineering Education (i2e2a) research page, and the site for an educational assessment tool that I am commercializing. With his team of creatives, I have transformed my thinking so I consider both marketing and my engineering education content in my endeavors. Borrowed mentors are somewhat similar to New mentors. They differ, however, in that there is some professional overlap in what they do with what you do. They are beneficial when you are trying to expand your network to people who might benefit from your professional expertise but don’t yet know who you are or what you have to offer them. For me, this is demonstrated with my engagement with a colleague interested in professional and personal interactions among individuals. His interest from a business perspective, coupled with my expertise in professional development for academics, has resulted in a soon-to-be launched product that has the potential to revolutionize interactions among diverse stakeholders. How to Identify Borrowed Mentors: These mentors are often found through common connections- people who know you and know your potential mentor. Research your current networks to identify potential connectors to people with common interests in other occupational sectors. Blue mentors are also what I call “Bad Day Buddies.” These mentors may have no knowledge of your professional work or expertise, but they know YOU. They know how to listen to you and respond to you based on your unique personality and preferences. They don’t condemn you for being real or honest, and they are not jealous of your successes. My Blue mentors are people in my inner circle. I have a couple of female faculty of color in my life with whom I express my frustrations and most intimate professional views. I know that they will not betray my trust and will give me advice that I don’t always want to hear but need to here. 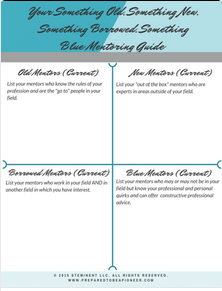 How to Identify Blue Mentors: There is no formula for finding these mentors. When you have a Blue mentor, you just know it. These mentors are often found organically and can be peer mentors as well. I have created a FREE 2 page ONBB Mentoring Worksheet for my readers who want to engage in an exercise to find their dream team. Check it out, and let me know what you think about it!